As we prepare for the glitz and glamour of fashion month, Fall 2019, and eagerly await looks from our favorite designers that will be live-streamed, Snapchatted, Tweeted, Pinterested and Instagramed by brands, their fans and their influencers, we thought we’d stop for a moment and take a look what goes into creating a collection; the skills , the hard work, the time and the sacrifice. As many aspiring designers know, this is no easy feat. And so, before we’re bombarded with fashion week images, let’s take a moment to celebrate a new crop of young talent who are throwing their hats in the ring and who we believe are worth watching. 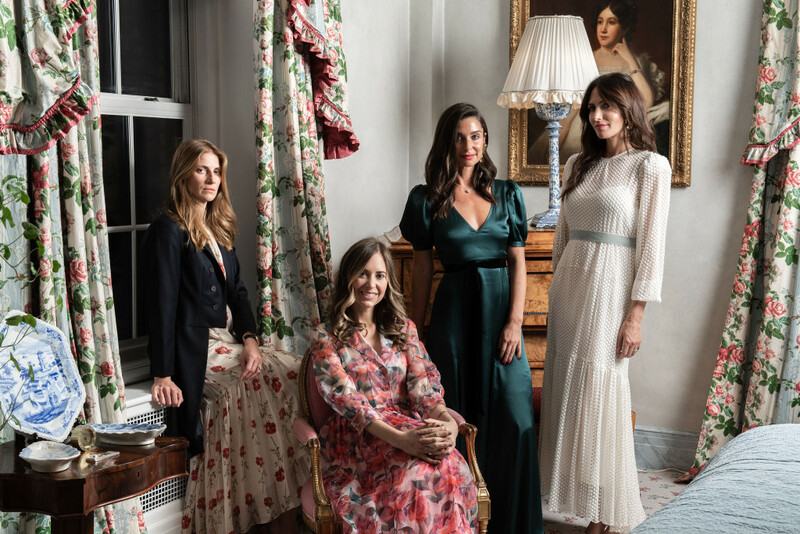 Here’s a story of four fashionable friends who started a fashion label together in NYC – Black Iris – that is launching for spring/summer 2019. Aly Gradone, Candice Miller, Chloe Rosenberg and Rachel Wexler all worked in various roles within the fashion industry, but came together to create a collection that would fill a void in the market that they found was missing. These fashionably chic working moms were looking for pieces to fit into their lifestyle, they wanted romantic yet easy-to-wear pieces cohesive enough to wear from school events to social gatherings and back to the office. So together, these four talented women created Black Iris. The collection includes 23 pieces, with multiple drops planned throughout spring on their own e-commerce (shopblackiris.com), as well as available exclusively on Moda Operandi and ShopBAZAAR for their launch on Jan. 23; priced from $395 to $1,395 (U.S. Dollars). The collection is filled with ladylike dresses and separates inspired by woman’s fashion in the late fifties, but with a modern silhouette. “Romantic, edgy pieces made for women by women,” they noted. While the brand leans far more romantic than the latter, these wearable pieces are for the girly-girl at heart. Saving the environment is a cause close to everyone’s heart, no matter what side of the Atlantic you live on. Today, more than ever, many fashion companies are thinking of ways to produce their collections in sustainable ways. A new crop of designers are even recycling existing garments and giving them new life. 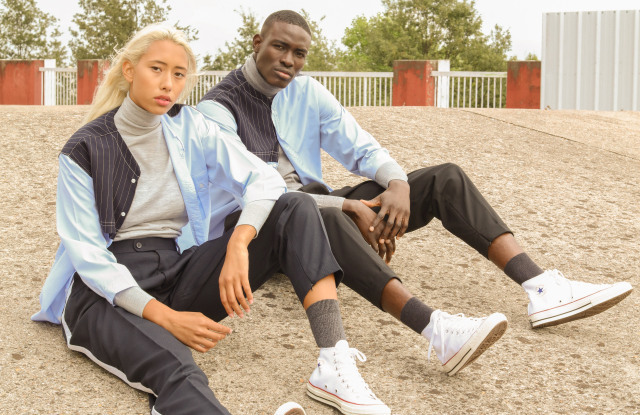 Meet Smith Boulet-Tongier, Ousmane Ndour and Ab Phetmanivong, the designers behind the French unisex brand La Draft. The concept for the collection began when the fashionable friends began reworking their existing old pieces that they were tired of and created new looks — cutting off a coat collar, adding a zip pocket — these re-created looks started gaining attention from family and friends. In December, 2017, the three friends took the plunge and created their fashion line La Draft. Their business model took off and quickly evolved. When the brand started, the designers were sourcing their clothing from local thrift stores and reworking them into new designs with the help of ateliers in La Goutte d’Or, an area in the north of Paris known for its African community. Ninety percent of the line is made of upcycled fabric. In January, 2018, the designers opened a pop-up store named Upcycling Experience, which was a great success. The designers invited customers to bring in their unwanted clothes and they would be customized for a fee right on the spot, and so La Draft decided to launch its own upcycling service. “We want to get customers to reuse things rather than overconsume,” Boulet-Tongier said to WWD on Dec. 20, 2018. “So we came up with a subscription service: For 100 euros per month, customers can ‘draft’ two items from their wardrobe, giving them a second life rather than hitting the shops to buy more clothes.” Individual pieces can also be upcycled for a fee. 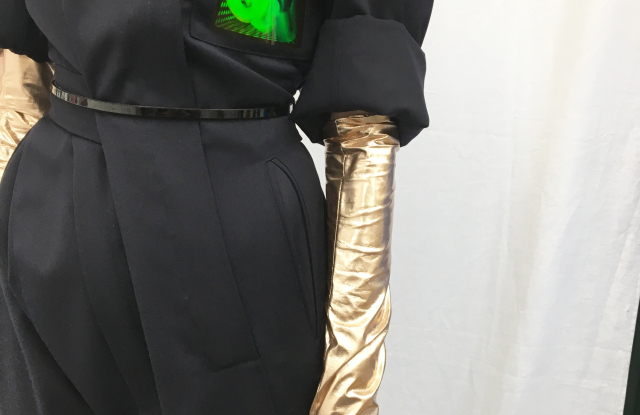 Giddy Up is a new Japanese label that perfectly combines classic techniques with special high-tech materials; the goal, to create a new high fashion experience, and the brand founder Mikio Sakabe and designer Yusuke Hotchi, put it to the test when they staged their first runway show in Paris on September 25, 2018. The duo developed a cutting-edge collection in collaboration with Japanese internet giant and 3-D printing specialist DMM. “Hi-tech always sounds so serious, I wanted to do something light,” said Mikio Sakabe to WWD in an article published on September 25, 2018. “Hi-tech trends tend to be associated with experimental design, but our focus is more on smoothly connecting people’s lives,” continued Sakabe. The duo positioned the label as a high-end fashion brand, which is why showing in Paris made perfect sense to them. During the show, the brand logo was flash up as a hologram on the garments and sneakers, with the direction centered on a mix of sportswear and tailoring basics. “The aim is not to be too extreme [in the hi-tech innovation], for it to be wearable,” said Sakabe. The collection focused on landscape prints, interesting surface textures, fabric manipulation, and 3-D printed zippers. It’s not every day that a young label gets dubbed by Net-a-porter as “one of Seoul’s most exciting labels”. Meet Seung-Gun Park, the talented designer behind the label Pushbutton. The former K-Pop star argues that his music career and fashion brand are completely separate from one another. But that may be hard to argue when his designs have already been worn by South Korean rapper Zico and Chinese singer Chris Lee. While Park has become a popular designer in South Korea, the designer is ready to expand his business internationally. The outcome, a bold collection filled with vivid colors inspired by the Nineties bubble economy in Japan and South Korea. “It was all about shopping and showing-off. Fashion was very extravagant and I find myself going back to that time and how we used to imagine the 21st century. This collection is my interpretation of the future from the past,” he noted. There were plenty of signature oversized silhouettes, shoulder padded blazers and coats, ruched cropped tops. PushButton’s pieces are available on Net-a-porter, Shopbop, Browns, LuisaViaRoma and on their own e-commerce site, which retail at around 450 pounds for pants and around 600 pounds for coats (UK Currency). 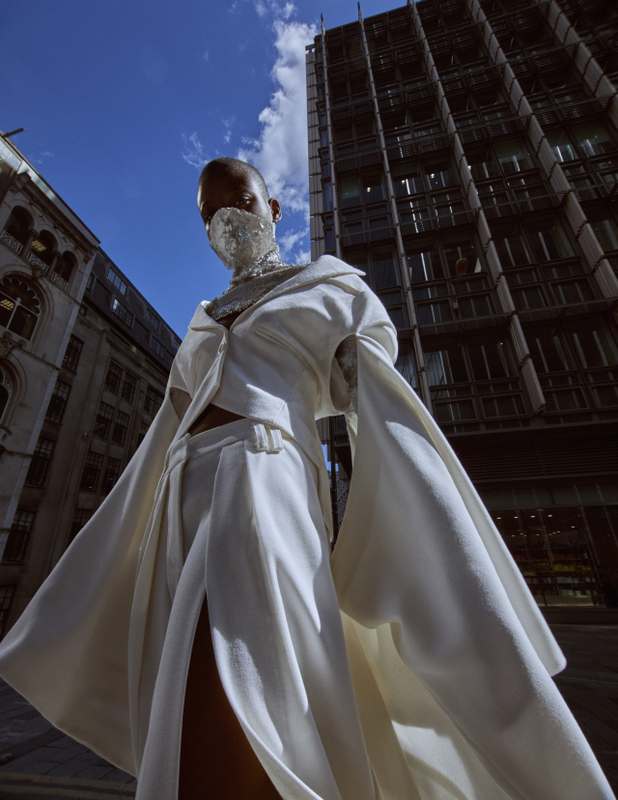 Born and raised in North London, womenswear designer Ricky Wesley Harriott favors utilitarian and multifunctional fashion that have an edgy and modern twist for his label Wesley Harriott. The designer plays with the juxtaposition between feminine and sporty, offering athletic lines and influences alongside corset-style lace up backs and sleeves. In 2018, the designer won the ASOS Fashion Discovery Prize – a competition run by the global online retailer created to help nurture and alleviate some of the financial pressure many young designers face today. The label has already been worn by a slew of celebrities ranging from Lady Gaga to Kylie Jenner. The collection will feature tight tops with face mask extensions, pinstripe jumpsuits, structured blazers nipped at the waist, and bag attachments sewn into skirts and dresses. He will also introduce eveningwear with dramatic Lurex jersey gowns and leather minidresses. Harriott’s collection is exclusive to Asos and will be a mix pieces from his archives as well as his new pieces, but they will all be interpreted for the ASOS client. Prices will range from 150 pounds (U.K. Currency) for the ninja-style crop tops, 300 pounds for trousers and 700 pounds for blazers. AS WE HEAD INTO FASHION MONTH, LET US KNOW WHAT NEW COLLECTIONS THAT YOU WILL BE FOLLOWING. AS EVERYONE KNOWS, HERE AT UNIVERSITY OF FASHION WE ARE DEDICATED TO TEACHING AND PRESERVING THE ART & CRAFT OF FASHION DESIGN!